MTS mPOS - Card swiping service on Smartphones! 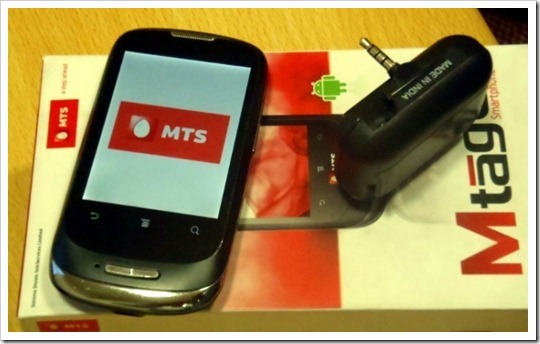 MTS mPOS – Card swiping service on Smartphones! MTS has announced launch of revolutionary service on its smartphones called – mPOS or Mobile as Point of Sale. The MTS mPOS is essentially a combination of a smartphone app along with a small hardware that reads debit or credit cards. The combination of this software and hardware doubles up the smartphone into a cost effective credit card swiping machine. MTS has launched mPOS as a bundle with its cheap mTag smartphone. Its is expected that the whole bundle (MTS MTag 3.1, mPOS attachment & One year Data plan) will cost roughly around Rs. 4000 making this attractive to many small businesses, Individuals as well as businesses who do home deliveries of their product. The average monthly spends on usage of MTS mPOS would be between Rs.200 – Rs.300. Merchant interested in this service has to first download the mPOS application on the MTS Smartphone (for the first time only). Once the mPOS attachment is connected to the Smartphone via the audio jack, it is ready for credit / debit card swiping. After credit card is swiped, customer needs to check the transaction details shown on the screen and authorize the transaction. The customer signatures can be taken on the MTS Smartphone screen itself. Once the payment is processed, intimation is sent to the card holder via SMS and email. For merchants the amounts are transferred to the registered bank account. MTS mPOS is currently undergoing a pilot with large Indian online retailers like Flipkart.com and Yebhi.com. Paymate was the first company to introduce this concept in India with launch of PayPOS earlier in May. However, they had come up with only an app at that time and were planning to ship hardware at later stages. Advantage with MTS mPOS is that it comes as a complete bundle which includes the smartphone, mPOS hardware attachment as well as one year data plan, which ensures that the entire solution will work out-of-the-box for consumers with minimum of hassle. MTS claims that service is fully secure and the Debit / Credit card details are fully encrypted at the time of transactions. MTS mPOS is also based on PCI – DSS (Payment Card industry – Data Security Standards) standards. Truecaller Reverse Lookup: Useful or Outright privacy breach? What’s update on this..is it working, open for small businesses ? ?